What Chrome, Safari and Internet Explorer sometimes report as a 500 server error is actually misleading. If you have a situation where Firefox works but Chrome shows a message like the one pictured to the right and IE simply says it cannot display the page (suggesting you might no even be online) then your issue may not be with your server. 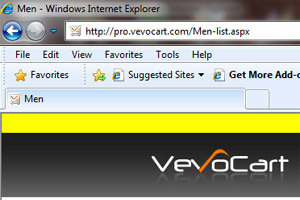 VevoCart is the asp.net offering for an online shopping cart and it was recently bought to my attention by a client. In terms of usability I have never applied it to a website because it is so poorly reviewed. You can read some stories of woe here: http://www.shopping-cart-reviews.com/carts/VevoCart.aspx.